But what about phone numbers that are mnemonic and listed as letters? Often called vanity numbers, these will be like 1-800-COMCAST, 1-800-MY-APPLE, 1-800-SOS-APPLE, etc, and they are not automatically detected by iOS. At first glance they don’t appear to be usable on the iPhone, but it turns out they are, just not directly. To call a vanity number and convert it to numbers, you just need to tap-and-hold on the alphabetic version, select “Copy”, and then go to the Phone app. 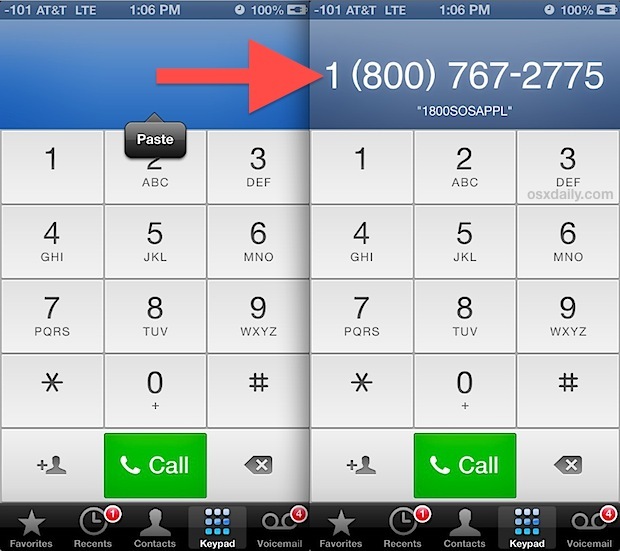 Once in Phone app, choose the Keypad, then tap and hold on the blank region on the top and choose “Paste”. This will instantly convert the lettered vanity number into an actual phone number, that’s nice in and of itself, but of course you can then dial it too. You’ll notice the vanity alphabetic number is still maintained below the converted numerical version, so you can be sure you are calling the right place. Heads up to iLounge for finding the handy little converter trick.